(Original Platform) How do I connect my WordPress Account? Atomic Reach supports integration with the popular CMS WordPress. By connecting your WordPress account with your Atomic Reach account, you can seamlessly pull your written articles from WordPress, and effortlessly edit and publish with Atomic Reach's suite of writing tools. Connect your WordPress account with Atomic Reach. Important: The Atomic Reach plugin is compatible with WordPress Version 4.6 or higher. Please make sure your WordPress account has the correct permission to install plugins. For this integration you will need administrator permissions to be able to install a WordPress plugin. Step 1: Sign into Atomic Reach, go to "Settings" and navigate to the "Integrations" tile. If your account is an WP-Admin account, the plugin will install automatically; if not you will receive an error form. Please contact your IT services and acquire the necessary information to fill out this form and press Proceed when you are done entering the correct information. Step 4: After the plugin finishes installing, click on the Activate button. Step 5: Click on the Atomic Reach on the navigation bar to your left. Step 6: Click on the Integrate Atomic Reach button. Step 7: You will be prompted to sign in to your Atomic Reach account, please enter the login information for the Atomic Reach account you would like to integrate your WordPress account with. 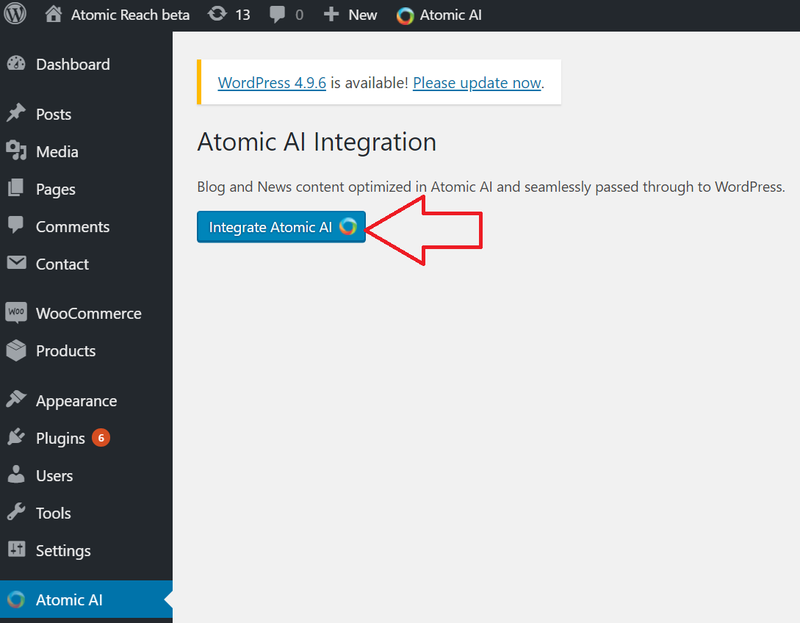 You have successfully connected your WordPress account with Atomic Reach! Click on the link going to the Create module, you will see a pop-up about your WordPress data populating. This can take up to 30 minutes. However, you will be see your drafts immediately under the Drafts button and you can start working right away. If you are experiencing issues with your integration, please reach out to support@atomicreach.com and we'd be happy to help you resolve this issue.